Everywhere I go (on the internet) people are posting their takes on the year gone by; the highs, the lows, the bests, the worsts, etc. Much of what I'm reading online now is just lists of what stuck-out for them in 2010. I don't follow too many rules for what or what not to post on this site - it's mostly whatever comes to mind at the time and compels me to write, provided I have the time to write it - but one thing which I've tried not to do with my posts is to 'dial it in'. The definition of lazy posting is pretty broad, but to me that basically means: no lists. Oh you see them everywhere you go: 5 Firefox extensions that every web developer needs, Top 10 beautiful websites, The 7 reasons why JSF blows goats... OK, those are very programmer-oriented, but even the mainstream lists are getting tiring: The 8 GI Joes most frequently left in the box, 6 heroic movie deaths that could have easily been avoided, 5 horrible life lessons learned from teen movies... (yes, those are Cracked articles, so Cracked, I'm blaming you for my list fatigue). For some reason, lists like those just scream lazy to me, like the person behind them enumerated their brain fart and attempted to legitimize it by putting it in some arbitrary order that only makes sense to themselves and their 15 cats. When I see it on a website, particularly one of those sites whose objective is to be a hub of like-minded people where the articles are supposed to impart actual knowledge and experiences, my mind starts imagining that I have direct access to the author and I ask them questions like, "Really, you couldn't think of anything better to write to get your paycheck?" before beating them over the head with the letter N book from a set of encyclopaedias. 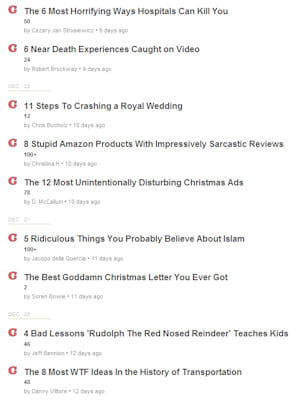 It irks me because when I see lists masquerading as articles, all I see is a copy-and-paste page that adds zero value to the collective knowledge of the internet. It's like the author thought, "Hey, I found a bunch of awesome related topics elsewhere so I'm going to duplicate those things right here to save you a couple of clicks and keystrokes." What that list then becomes is a page that acts as an index to other pages. You know what? We already have a site that does that for us: Google. This isn't a battle I can win though: everyone loves lists, especially the internet. I mean, if someone else can be bothered bringing the information to you, then why not? (Lazy SOBs, the lot of us.) Some of the most popular sites out there, while not creating lists themselves, are those whose sole purpose is to give you the news from other sources (eg: Digg, Slashdot). And one of the most subscribed YouTube channels is just a guy who tells you about other popular YouTube videos. Even I like lists, but seriously content authors: please please please write articles that make me feel smarter for having read them; give me some knowledge that I can use in my own job or life; and share your experiences in those fields so I can maybe apply them to my own. Don't just entertain me - if I wanted to do that, I can just shoot over to YouTube and watch the latest [adjective/pop-culture-noun] cat - but give me something that will help me, as a person, grow. I'll let it slide for now because everyone and their mothers is doing the 2010 retrospective in bullet-point format, but the next time somebody tells me what 5 extensions I must install on Firefox, I'm shutting-off the computer and going to go outside or read a book. You know, something healthy.